Jigokudani or Arishiyama Monkey Park? Trying to determine if it's worth making a day trip from Tokyo to Nagano specifically for Jigokudani Monkey Park, or if Arashiyama Monkey Park will suffice. I like the idea of seeing the Monkey's in the snow/forest environment, however we will be visiting Arashiyama while in Kyoto anyways..
Any thoughts or your preferences would be greatly appreciated! They are two completely different offerings. Jigokudani is more about watching them in the wild and in the springs. You don't normally get close to them. The monkey park in Arashiyama, you can get up close to them, feed them by hand. They have a few feeding show each day also. I had a giggle last time I was there, one big older male had fallen asleep on one of the workers motor cycle scooter. I would think it also depends on whether you want to travel there as well. I like Nagano a lot, but it is a longer trip to see the monkeys there (at least 2 .5 hours from Tokyo) vs. Arashiyama. Both will involve some walking in the woods, however you are more likely to be walking in the snow in the woods if you are trying to see Jigokudani in the snow. I've personally never done Jigokudani, just other things in Nagano. I have been to Arashiyama several times to see the monkeys. My daughter enjoyed feeding them immensely. She loved seeing all the baby monkeys. Thank you for your replies. We don't mind the travel to Nagano, if it makes the experience that much better. It would just mean committing a full day with the travel required. Also not much interest in feeding the Monkeys.. Seeing them in their natural environment is what we care most about. I should also mention we are going in March, if that makes a difference? it may see fewer(about half or less than) monkeys entering the hot springs. But access road is in deep forest, snow melting very slower be careful. And you can watch livecam(pic and steaming) fr now. bc park placed higher ground, some up stairs harder like this. 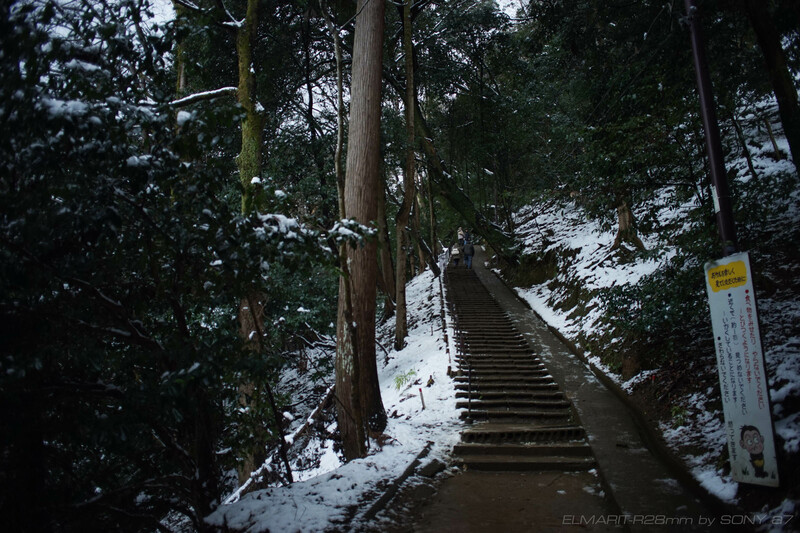 Park name is Arashiyama monkey park "Iwatayama(Mt.Iwata)". If the weather is nice, the scenery is the best. Both park monkeys is "wild", you cannot touch them. especially Jigokudani park rules big changed "No selfie stick". That was the very reason I revisited the Jigokudani winter time, after a very disappointing summer visit. I am sure you won't be disappointed. I have visited the monkeys at Arashiyama once - that was enough. I found it more like a zoo (and an odd one), but most of the people enjoyed the experience. The walk up the hill was difficult for some. Jigokudani I visit maybe a dozen times a year. I like the environment and walk to the monkeys better than Arashiyama and across the different seasons. March is probably still icy on the path, but that is not so hard, most of the route is flat and easy walking. Also, that time of year they still get the occasional heavy snow-fall (2016 springs to mind - made my visit in early April pretty cold with fresh snow). As a day trip from Tokyo, that does make for a long day. I didn't think the Arashiyama Monkey Park was all that interesting either. It was nice enough, but not a place I'd ever feel the urge to visit again. Alps Park is set in the hills on the north side of the city, and it's easily reachable by bus (or taxi), or on foot if you don't mind a good walk uphill. My personal recommendation would be to walk back down, taking the ridgeline between Alps Park and Joyama Park, because the view of the Japan Alps to the west is amazing.